Angry and frustrated residents are demanding answers after a police-involved shooting left an unarmed, Black man dead last week. 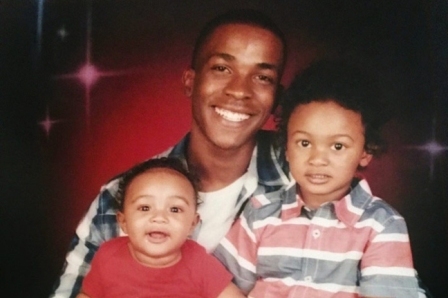 Stephon Clark, 22, was fatally shot in his Meadowview area backyard Sunday, March 18 after two Sacramento Police Department (SPD) officers shot at him more than 20 times. Local law enforcement officers were in the area after receiving a 911 call about a man suspected of breaking into vehicles in the area. A Sacramento County Sheriff’s Department helicopter spotted a man they believed to be that suspect, described as being 6’1”, thin, and wearing a black hoodie and dark pants, in a backyard and they directed SPD officers on the ground to that location. Helicopter personnel also communicated to officers that the suspect had picked up a “toolbar” and broke a window to a residence. Officers who had been canvassing other yards, eventually entered the front yard of a home on the 7500 block of 29th Street and observed Clark, along the side of the residence. Officers commanded Clark to stop and show his hands. According to a statement released by the SPD, the officers say Clark turned and advanced towards them while “holding an object which was extended in front of him.” The officers said they believed Clark was pointing a gun at them and, “fearing for their safety,” they fired their duty weapons. Police admit they only found a cellphone, not a gun or a “toolbar,” on the scene. On Wednesday, March 21 the SPD released video footage of the interaction from the body cameras worn by both officers, as well as audio from the initial 911 calls and dispatch. Chief Daniel Hahn, the city’s first African American police chief, has vowed to be transparent in such incidents since he took the position last year. Sacramento City Council policy on Police Use of Force mandates that the SPD release video and audio associated with police-involved shootings to the public within 30 days. The policy was adopted after a mentally ill Black man, Joseph Mann, was shot and killed by SPD officers in Del Paso Heights in 2016. The three-day turn around in the Clark shooting is much quicker than has happened in years past. “SPD acknowledges the seriousness of this incident and the impact it has on our community,” reads one of two statements on the shooting, released by the SPD last week. “We are committed to providing timely information, communicating openly, and working directly with our community, so that they have a full understanding of what occurred,” the statement continues. The body camera videos are each about 17 minutes long. While neither officer has been identified, one appears to be White or Hispanic and the other African American. In the graphic video, the officers don’t appear to identify themselves as police officers, but simply say, “Hey, show me your hands, gun” and seconds later “Show me your hands, gun, gun gun,” before one shoots off 10 rounds and the other, at least 11. Officers waited five minutes for backup to arrive and can be heard telling Clark, who was unresponsive, to show his hands. One officer tells another to grab a “non-lethal” from a police vehicle so they can “hit him a couple of times with that” before approaching him. When officers did approach Clark’s body, he was laying face down on the ground. They handcuffed him and began CPR. He was pronounced dead on the scene by the Sacramento Fire Department. The use of non-lethal weapons, such as rifles that shoot bean bags at suspects, were part of reforms fought for by local activists after the Mann incident and the shooting death of another Black man, Dazion Flenaugh; the mandatory use of body cameras was also part of the reforms. “You authorized non-lethal weapons. Why weren’t non-lethal weapons used in this instance?” Richard Owen, co-chair of the Law Enforcement Accountability Directive, asked of the city council during a meeting where the Stephon Clark shooting incident was discussed. Owen, a retired school principal, also questioned why officers waited before attempting to save Clark’s life. While Owen said he’d hold off for the video to reveal the facts, he addressed some of the most salacious rumors that have been circling in the community regarding the shooting. “If this man was shot in the back and shot 20 times, that’s excessive force without question,” Owen said. Chief Hahn, who was at the meeting to read an official SPD statement, and answer questions, said those elements of the incident are currently under investigation. Family members are also asking why the body cameras were muted for a period of time. Black Lives Sacramento leader Tanya Faison also spoke out at this week’s city council meeting. “I’m sick of seeing people die that look like me,” Ms. Faison said. She called for the firing of the officers involved in the shooting, as others in the audience voiced their agreement. Also concerning members of the public is how police interacted with Clark’s family after the shooting. The home where the shooting occurred was that of his grandparents, with whom he’d been staying. His grandmother, Sequita Thompson, told local media that the police questioned her for hours about what she’d heard, but was never told that her grandson had been shot. It wasn’t until she looked out of a window that she saw him on the ground, dead. 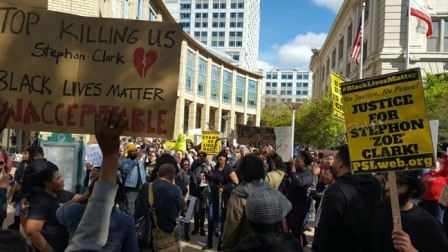 Local and national Black leaders have vowed to demand justice for Clark and his family. Black Lives Matter and Rev. Les Simmons of South Sacramento Christian Center spearheaded vigils and rallies, where those who knew Clark called him a loving son and father of two young boys, who didn’t deserve to die. The Rev. Al Sharpton says he’s talked with Clark’s mother, Sequette Clark, and that he’ll visit Sacramento in the coming weeks. Rev. Sharpton has spoken out against the police involved deaths of Mike Brown in Ferguson, Missouri; Philando Castile in Falcon Heights, Minnesota; and Eric Garner on Staten Island, New York. “It is an atrocity that an unarmed young man was shot at twenty times in his own backyard and shows the urgent need in these times for intervention against police misconduct. We will call for a complete and thorough investigation into this young man’s death,” said Rev. Sharpton, the founder of the National Action Network, in a statement. Sacramento NAACP President Betty Williams has vowed to “stand guard to (ensure) there is a just outcome for all parties involved.” In a statement, Ms. Williams says she’s calling for an independent investigation and has asked the FBI to get involved. The shooting is being investigated in conjunction with the Sacramento County District Attorney’s Office, the Sacramento City Attorney’s Office and the City’s Office of Public Safety Accountability. Per department policy, the two officers involved have been placed on paid administrative leave. The Sacramento Observer is a member publication of the National Newspaper Publishers Association. Learn more about becoming a member at www.nnpa.org.